(Coisceim na Caillighe) / County Cork. 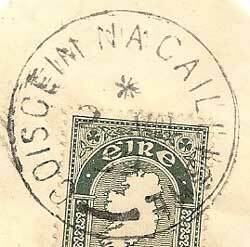 The post office opened in 1864-5.It has a recorded English and Irish SR date stamp and an English Rubber Mark. Postmark type - Circular, Singe Ring, Code at top, date as DD MM / YY, short arc at base.